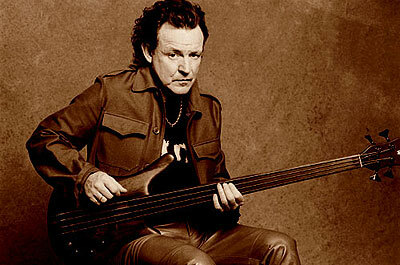 Jack Bruce, best known as the bass guitarist, songwriter, and lead singer for the rock super-group Cream, has died of liver disease at the age of 71. Beginning in the mid-’60s, Cream was one of the greatest influences in rock history, making the “power trio” (guitar, bass, drums) a staple of the blues-rock and hard rock genres. Cream guitarist Eric Clapton and drummer Ginger Baker were widely acknowledged as among the very top of their profession, but Bruce didn’t initially receive quite the same level of approbation, even though his bass guitar playing and his dramatic, expressive, but tasteful vocals were certainly in their league. Eventually, however, he became known as one of the greatest bass guitar players of all time and had a huge influence on subsequent musicians. Before Cream, Bruce made his mark with Graham Bond’s bands (with Baker and virtuoso guitarist John McLaughlin) and Jon Mayall’s Bluesbreakers (with Clapton on guitar), and then with Manfred Mann, performing on songs such as “Pretty Flamingo.” Mann, who was a highly talented keyboard player, praised Bruce’s instrumental prowess and musical knowledge. After Cream, Bruce recorded several solo albums over the years, some of them quite good (such as Songs for a Tailor), and recorded and performed with a wide variety of musicians and singers, notably appearing as a member of Tony Williams’ Lifetime and West, Bruce, and Laing. He also recorded with luminaries such as Frank Zappa and Lou Reed. Probably my favorite of Bruce’s post-Cream musical activities was his work with Robin Trower on two albums, BLT and Truce, in the early ’80s, and their 2008 reunion, Seven Moons. Faced with the need to replace the superb singer and bassist James Dewar, Trower went out and grabbed the man on whom the Dewars of the world had based their careers: Bruce himself. The albums were among the Trower trios’ best work. Some of this frenzy of activity on Bruce’s part resulted from financial pressures caused by his drug abuse and eventual loss of much of his money. Despite those travails and bad personal choices, Bruce’s distinctive voice and excellent bass guitar work seldom failed him; where he really seemed to lose his way after the Cream years was as a songwriter. He could write good songs on occasion, but he could not recall the consistency he had achieved with Cream. The jazz influence Bruce brought to Cream was an important element of their huge success, in my view. Without slighting Clapton in any way, the guitarist’s devotion to American blues music at the time would have placed fairly strict limits on the band’s sound had it not been countered by influences brought in by the other members of the group. Bruce’s experience in jazz and his pop-oriented sense of melody, combined with Baker’s jazz experience and interest in non-Western rhythms, made Cream much more than an English blues band performing songs such as “Crossroads,” “Spoonful,” and “Born Under a Bad Sign.” As engagingly as Cream performed those songs, the pop- and jazz-influenced compositions they wrote and performed gave the band much greater reach both artistically and commercially. In fact, many of Cream‘s best songs show these latter influences, such as “I Feel Free,” “I’m So Glad,” “Strange Brew,” “Badge” (written by Clapton and George Harrison), “Tales of Brave Ulysses,” and “We’re Going Wrong.” Among the band’s biggest hits were “Sunshine of Your Love” and “White Room,” both of which skillfully combined the band’s blues, pop, and jazz influences into powerful songs that reflected the eclectic and adventurous spirit of the times. That combination of influences, along with the great talents of the band members, made Cream what it was, and Bruce was a crucial element of the band’s success. Bruce was truly a giant of rock music. I’d think that the general public attributed–and perhaps still does–all those great Cream vocals to Clapton. Nice catch on Jimmy Dewar being a mere JB epigone! I love him, but let’s face it, he was doing Bruce’s act. Fantastic tribute, Sam, for a fantastic musician. Thanks!